I am not eating much meat these days, but I could not resist the chance to roast some chicken with the harissa I made for our March spice potluck. I just knew it had to be tasty, so I went looking online for some suggestions. What I found mirrored the ingredients I was already contemplating so I winged it and came up with my own version. 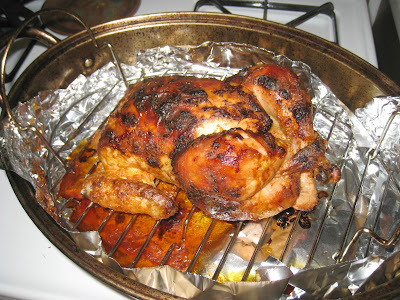 The result was a juicy tender bird that was quite flavorful; however, I would use more of the harissa in the marinade. But I just added more as I ate it, so it was not that critical. Here is the bird with the yogurt marinade added just before getting closed up and put into the refrigerator for the day. It was a quick enough process that I was able to find the time to get it ready in the morning before leaving for work, so by the time I got home it was ready to go right into the oven and be roasting while I made some whole wheat couscous with zucchini to accompany it. Yogurt and Harissa Roasted Chicken would make a lovely dish for company, but it is easy enough to make any time. As a matter of fact, I have already made it twice. Salt the chicken generously and place in a large zip-top plastic bag. Add the rest of the ingredients and massage them through the bag into the chicken. 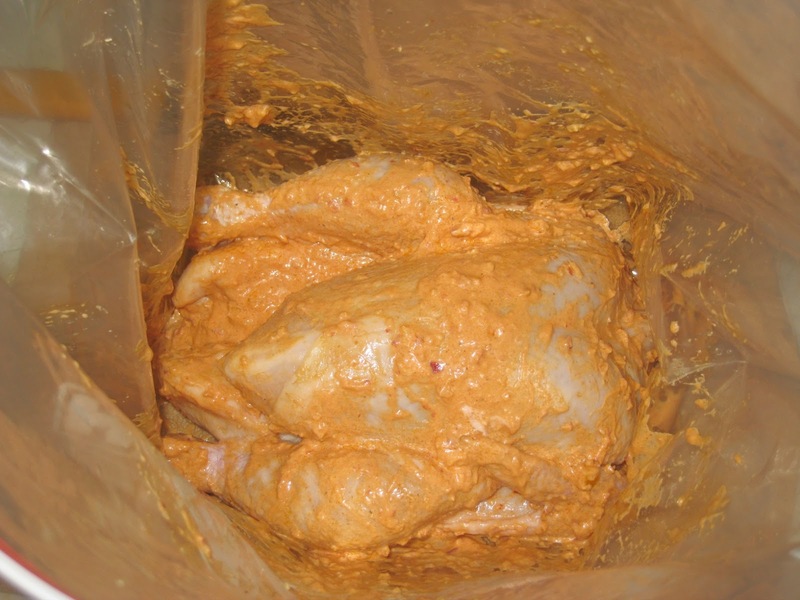 Refrigerate and let marinate for at least 2 hours up to overnight. Remove the chicken from the refrigerator and let it sit out for at least 15 minutes (but no more than two hours). Remove the chicken from the plastic bag and place it on the rack of a roasting pan. Roast the chicken for 15 minutes at 425°, then lower the heat to 350° F. and continue to bake until the interior temperature of the thigh reaches 160° F.
Remove the chicken from the oven and let it rest for 15 minutes befrore carving.